Are Purebred & Mixed-Breed Dogs Equal In Genetic Disorders? Should breeders stop breeding purebred dogs? In 2013, there was a bit of an uproar about a study from the University of California, Davis comparing the health of purebred and mixed breed dogs. Much of the press coverage (and, indeed, the press release from UC Davis itself) suggested that the study found that mixed breed dogs were not healthier than purebred dogs, as campaigners often maintain. The article released found on UC Davis’ website starts with a strong statement. If you think your mixed-breed pup is naturally hardier than the neighbour’s purebred, you may want to think again. A new study by researchers at the University of California, Davis, indicates that mixed breeds don’t necessarily have an advantage when it comes to inherited canine disorders. The study itself (PDF) clearly states the following results, and we have simply copied and pasted their own wording without editing one word. Objective—To determine the proportion of mixed-breed and purebred dogs with common genetic disorders. Animals—27,254 dogs with an inherited disorder. 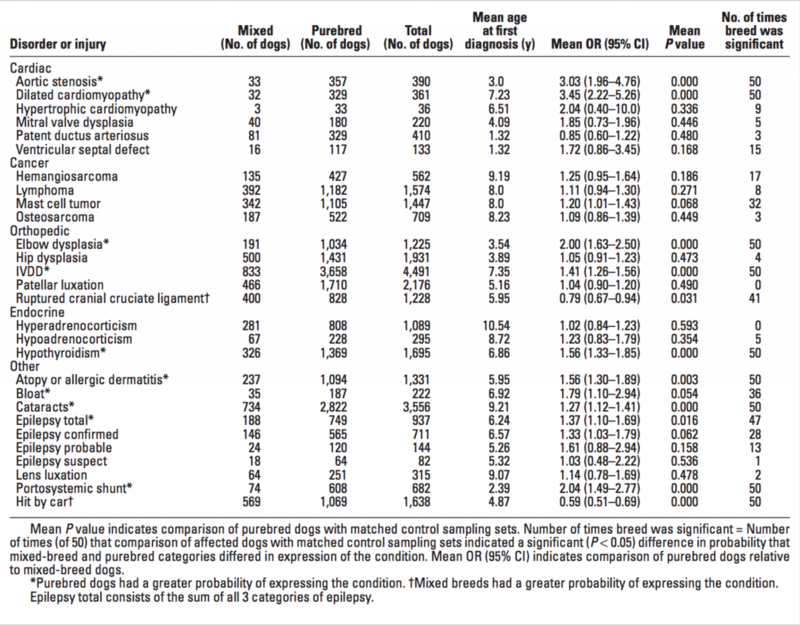 Results—Genetic disorders differed in expression. 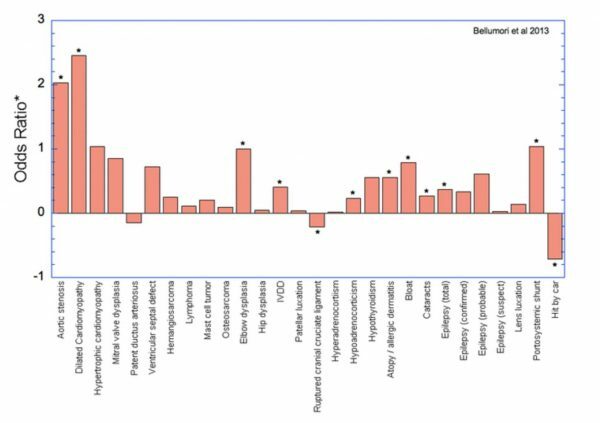 No differences in expression of 13 genetic disorders were detected between purebred dogs and mixed-breed dogs (ie, hip dysplasia, hypo- and hyperadrenocorticism, cancers, lens luxation, and patellar luxation). Purebred dogs were more likely to have 10 genetic disorders, including dilated cardiomyopathy, elbow dysplasia, cataracts, and hypothyroidism. Mixed-breed dogs had a greater probability of ruptured cranial cruciate ligament. In fact, when you looked closely at the data above, it showed nothing of the sort. It actually found that mixed breeds were, overall, healthier than purebreds. We have computed those results into a comparative table for you to visualise the data in a more intelligible manner. Carol Beuchat, from the Institute of Canine Biology, has written a blog about it and she includes this telling graphic of what the study actually found. The disorders suffered more by purebreds are shown above the zero line, and disorders more common in mixed breeds are expressed below the line. One of them, hit by a car, is obviously not genetic. Chart comparing genetic disorders’ risks between purebred and mixed-breed dogs. Amazing, isn’t it, that anyone could have interpreted it as proving that mixed breeds are not healthier? Bearing the decrypted results from this study, dog breeders should not suddenly stop purebred dog breeding and convert to mongrels, but instead, these results give us insight into how dog breeding practices might be modified to reduce the prevalence of certain genetic canine disorders. We are, at BreedingBusiness.com, advocate of healthy dog breeding whether it be for purebred dogs or mongrels. We, above of anybody else, want you to breed purebred dogs but we want you to be conscious of the current genetic situation. The good thing is that we are aware, there are just simple actions to take before a mating to prevent genetic conditions to increase even more. Let’s be determined to carry on breeding healthy purebred dogs, and give back the great reputation our favourite breeds deserve! I went to Carol Beuchat’s blog post on this, and she does address the semantics issue as well as the challenges of finding a “perfect” data set. The UC Davis study does clearly identify 10 genetic disorders that are much more common in purebreds – but remember, not more common in ALL purebreds but rather specific breeds. One thing that this study does not specifically address is to identify breeds that are impacted by fewer genetic disorders. Dr. George Padgett’s classic book, Control of Canine Genetic Diseases, DOES list major genetic disorders by breed. This book should be in every responsible breeder’s library. Also, by disregarding the UC Davis study, my worry is that this encourages random breeding because “mixed breeds are healthier.” The worst cases of hip dysplasia I have seen were all in large mixed breeds. I think it is very difficult to generalize about the health of mixed breeds versus purebreds.